A 34-year-old male presented to us with the chief complaints of headache since 3 weeks earlier, with the headache being more severe during nighttime, fever since 2 weeks earlier, and nausea and vomiting since 1 week earlier. The patient also had episodes of intermittent disorientation. General physical and cardiorespiratory examinations were normal. Central nervous system (CNS) examination revealed papilledema, and signs of meningeal irritation (neck stiffness, Kernig's sign, and Brudziñski's neck sign and leg sign) were present. The "jolt accentuation maneuver" was present. Complete blood count: Hb 13.3 gm%; total leukocyte count (TLC); 6,900/cu mm; platelet count: 3,06,000/cu mm; random blood sugar (RBS): 106; magnetic resonance imaging (MRI) brain: Normal; human immunodeficiency virus (HIV) I/II: Negative. Cerebrospinal fluid (CSF) examination: TLC 33 cells, differential leukocyte count (DLC) polymorphs 20%, lymphocytes 80%, proteins 186 mg%, sugar 17 mg%, serum lactate dehydrogenase (LDH) 351 IU/L. CSF India Ink preparation: Positive showing Cryptococcus neoformans [Figure 1]; urease test positive; CSF latex agglutination assay of cryptococcal antigen: Positive (titer 1:1000). 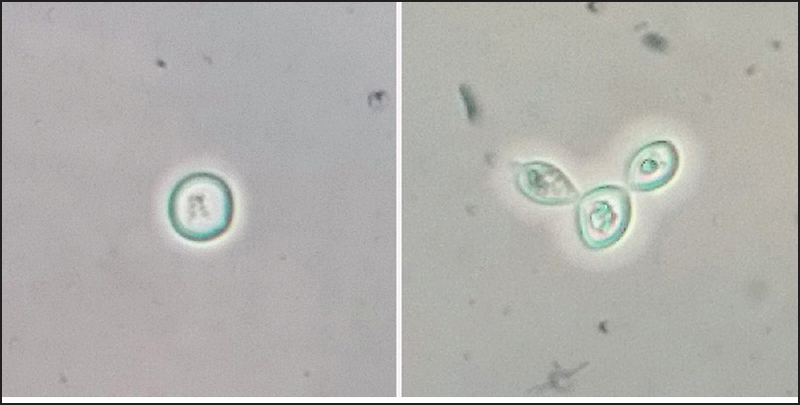 CSF culture: Showed growth of Cryptococcus neoformans on Sabouraud dextrose agar (SDA) [Figure 2]. The patient was treated with a combination of amphotericin B 1 mg/kg/day for 10 weeks and fluconazole 400 mg/day for 10 weeks; due to unaffordability and unavailability, flucytosine could not be added. Steroid therapy was added for 6 weeks. The patient improved gradually and became asymptomatic, and the papilledema gradually subsided. Raised intracranial tension was also present in our case. Complications of the same are known to occur in CM. To conclude, CM is rare in immunocompetent hosts and because of the low index of suspicion, the diagnosis is often delayed/missed, resulting in poor prognosis with severe consequences. Our case was unusual, as the patient showed improvement with the combination of amphotericin B and fluconazole for 10 weeks, while flucytosine could not be given as per standard therapy due to unavailability and unaffordability. Thompson HJ. Not Your "typical patient": Cryptococcal meningitis in an immunocompetent patient. J Neurosci Nurs 2005;37:144-8. Bello YB, Machado HG, Silveira JF, Schettini F, Martins G Jr, Dortas S Jr, et al. Cryptococcal Meningitis in immunocompetent patient - Case Report. Am Med J 2013;4:100-4. Costa ML, Souza JP, Oliveira Neto AF, Pinto E Silva JL. Crpytococcal meningitis in HIV negative pregnant women: Case report and review of literature. Rev Inst Med Trop Sao Paulo 2009;51:289-94. Perfect JR, Dismukes WE, Dromer F, Goldman DL, Graybill JR, Hamill RJ, et al. Clinical practice guidelines for the management of crytococcal disease: 2010 update by the infectious diseases society of America. Clin Infect Dis 2010;50:291-322. Sachdeva RK, Randev S, Sharma A, Wanchu A, Chakrabarti A, Singh S, et al. A retrospective study of AIDS-associated cryptomeningitis. AIDS Res Hum Retroviruses 2012;28:1220-6.